According to AAA, the average driver pays around $10,000 each year to keep a car on the road. For college students, costs can be even higher. Parking on campus means splurging on a pass or wasting precious time searching for an open parking spot. With that in mind, you might want to consider ditching the car to save money ― and yourself from the hassle. With a bit of careful consideration and research, you won't miss much by going carless, but you have to choose wisely. To help you make the decision, we put together this list of the best cities and towns for students without a car. New York is one of the most pedestrian-friendly cities in the United States. The subway system runs 24 hours, and its 468 stations serve all of New York and the surrounding areas. The system works so well that fewer than half of New York households own cars at all. New York is also in the midst of a big push toward greater bike friendliness. Arguably the biggest college town in the U.S., the Boston metro area boasts 33 colleges and universities, including two of the most prestigious worldwide. The city’s subway -- Bostonians call it "the T" -- is the oldest in America and covers most of the city, with buses filling in the gaps. With plenty of cycling options, Bicycling Magazine ranked Boston the 26th most bike friendly metro in the country, even though long snowy winters can keep bikes off the road for several months a year. The nation’s capital boasts a comprehensive and expanding metro rail system and moderate winters, making it ideal for walkers and bikers. The trains and buses run to midnight on weekdays and until around 3 a.m. on weekends. The city is at the forefront of a biking revolution. DC was ranked 4th best in the country by Bicycling Magazine, thanks to an explosion of new bike lanes and riders over the past years, not to mention relatively flat terrain. The epicenter of the growing tech economy, San Francisco enjoys temperate weather year-round and a compact, picturesque urban landscape. The downtown area is highly walkable and offers a mix of buses and rail for getting around. For longer trips, the Bay Area Rapid Transit (BART) system offers trains linking downtown to the airport, Oakland, and surrounding suburbs. The city is also very bike-friendly and ranked 8th best by Bicycling Magazine, though the steep hills can make for some challenging rides. Altogether, a little over 30% of San Francisco households get around without a car. Biking is where Minneapolis-St. Paul really shines; it was ranked second nationwide by Bicycling Magazine, an impressive feat considering the frigid Minnesota winters. A comprehensive network of bike lanes and trails link downtown to surrounding areas. Compared to similarly-sized metro areas, Minneapolis-St. Paul once lagged behind in public transit, but the city completed its first light rail line in 2004, connecting the airport, downtown Minneapolis, and the Mall of America. Another line is under construction that will link the University of Minnesota to downtown Minneapolis, making the city even more accessible. Home to software giants Microsoft and Amazon, the Seattle area is buzzing with development, and it has ambitious transit plans to match. A comprehensive bus network serves the area, and a new light rail was completed in 2009, connecting downtown to southern neighborhoods and the airport. More expansion is in the works, including an extension to the University of Washington and several streetcar routes. The city is also laying down bike lanes left and right, but the hilly terrain and drizzly weather means cyclists need thick skin. Though options are growing, over 80% of residents still depend on cars. Infamous for its sprawl and traffic jams, L.A. may not be a paragon of mass transit, but the city is working hard to burnish its image. Since the early 1990s, L.A. has built a network of subways and light rails, and today its metro and buses are second only to New York’s in daily ridership. Though students without cars must contend with the sheer size of the city, the year-round sunny weather makes for excellent walking and biking, provided you don’t have too far to travel. Baltimore is a big and relatively compact city, so the decision to go carless is common, especially among students. Over 30% of residents don’t own a car, and only 5% of Johns Hopkins students have vehicles on campus. There is a light rail that runs north to Hunt Valley and south to the BWI Airport, a subway that travels east to Owings Mills, MD and west to Johns Hopkins Hospital, and 57 bus routes that link the rest of the city. Most of these services run between 5 a.m. and 1 a.m. on the weekdays, and there are a few bus routes that run 24 hours a day. Denver is an ideal city for cyclists. There are record numbers of sunny days, numerous bike lanes, and a city-wide bike-share program. Depending on where you live in the Denver area, you won’t miss a car for everyday activities. The city has several light rail lines, with a stop at the University of Colorado’s downtown campus, and a bus system connecting other campuses and parts of the city. Keep in mind that certain parts of Denver -- and the Rocky Mountains -- have limited public transportation. Chicago is the third largest U.S. city with the second largest public transit system. Just about all neighborhoods are linked together by buses and the iconic raised "L" trains, which radiate out from the city center in all directions. Thanks to the density of the downtown and other neighborhoods, walking is always a good option. While bike-friendliness has lagged behind other cities in the past, the Windy City is constructing an impressive 100 miles of separated bike lanes over the next few years. Philadelphia is the 5th largest city in the U.S. and home to numerous educational institutions, including the University of Pennsylvania, Drexel and Temple. At the University of Pennsylvania, only 3% of students have cars. That’s because the city is served by a comprehensive network of rail and bus lines that 27% of residents use as their primary mode of transit. Additionally, more than 25% of arterial streets are equipped with bike lanes, and the city is dense; not having a car in Philly may actually be easier than having one. St. Louis has one major light rail line running across the Mississippi, cutting through downtown. Like many mid-sized American cities, living without a car is possible, as long as you choose the right neighborhood close to a station or a bus stop. If you live in a neighborhood close to downtown, walking is a pleasant option, and there are bus routes that provide access to the city center from the city’s surrounding suburbs in both Missouri and Illinois. Beautiful and sunny Miami has one major light rail line running along the coast, with several stops, including downtown and at the University of Miami. Alternatively, a comprehensive bus system serves the metro area. Downtown Miami is constantly being revitalized, making the city a delightful walking town. Cyclists may find challenges in a still-developing bike route infrastructure, but the warm weather provides ample opportunities to explore. The largest college in town is San Jose State University (SJSU), located in the city’s walkable little downtown. In addition to numerous buses, San Jose has an expansive light rail system that ties the area together. The city was originally designed for cars, so walking distances can be far. As a result, about half of the students at SJSU own cars. On the bright side, the city has plans to make its downtown one of the most bike friendly in the nation, and with 300 days of sunshine a year and flat terrain, the outlook is good. Located smack in the heart of America’s rust belt, Pittsburgh has undergone a major urban revival. Downtown living is affordable, and several schools, including the University of Pittsburgh and Carnegie Mellon, are centrally located. Living in Pittsburgh without a car is definitely an option; in fact, only 12% of Carnegie Mellon students have cars on campus. Pedestrians can depend on numerous buses and two major light rail lines, and the city has ambitious plans to increase bike accessibility. Buffalo is served by one major light rail line connecting downtown and the State University of New York (SUNY), Buffalo campus in the south. There are also several bus lines around town, but some far-reaching parts of the city may be difficult to access without a car. As a result, almost 70% of SUNY Buffalo's 29,000 students have cars on campus. The city is making an admirable effort to improve bike infrastructure, which should bring more areas within reach. Home to several higher-education institutions, including Trinity College and University of Connecticut School of Business, Hartford is a compact city ideal for pedestrians. The downtown, riverfront, and several parks are within walking distance of Trinity, UCONN Business School, and the community college. There is also a bus network for trips to the suburbs, and larger bus companies connect Hartford to cities around the Northeast. Portland has a nationwide reputation for progressive city planning, and it is well deserved. The relatively small city was ranked #1 for public transit and walkability by Travel + Leisure magazine in 2012. There are several light rail lines linking the airport and suburbs, streetcars running throughout downtown, and an efficient bus system. Ubiquitous bike lanes, flat terrain, and mild winters also make Portland a biker’s delight. In short, attending college in Portland without a car poses no problems. If you are a cyclist, you may find Salt Lake City to be more than agreeable. Numerous sharrows (shared lanes) and isolated bike lanes have led the city to be ranked consistently among the most bike-friendly places nationwide. Salt Lake City’s three light rail lines and buses also earn praise for efficiency and coverage. It’s certainly possible to go without a vehicle in Salt Lake, but many students still opt to drive, with more than half of University of Utah students, and 28% at Westminster College, owning cars. Providence is an old and relatively dense New England city. As a result, over 10% of the city's residents walk to work daily. At two of the largest colleges in town, Brown University and Providence College, only 20% and 16% of students own cars, respectively. When you can’t walk, a bus system runs throughout the city, and trains provide short rides to Boston, New York, and beyond. The largest city in Wisconsin, Milwaukee also has one of the highest rates of students per capita in North America, with several small colleges and the University of Wisconsin, Milwaukee. Many students don’t drive and instead rely on the transit system that runs buses around town and into neighboring cities, like Chicago, Madison, and Green Bay. Milwaukee is also known to be very bike-friendly, ranked 24th best by Bicycling Magazine. The city has ambitious plans to add over 100 miles of bike lanes. Cincinnati’s downtown is served by a network of bus lines, branching out in all directions, and streetcars are in the works. The city was ranked as a bronze-level community by the League of American Bicyclists, making cycling an option for students as well. 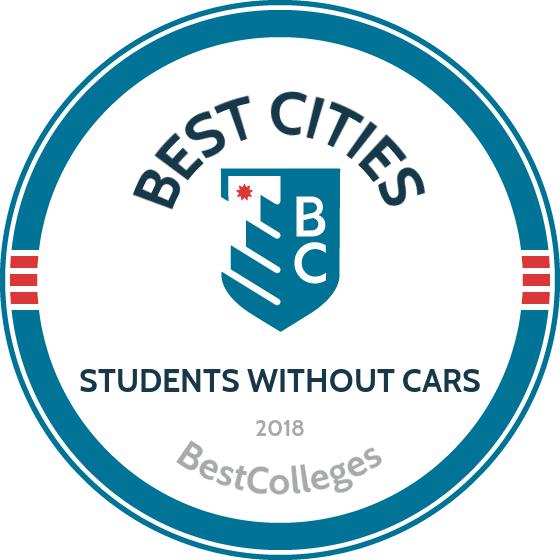 Attending University of Cincinnati, Xavier University, or Miami University is certainly comfortable without a car, though a large portion of students do choose to drive. Urban revitalization efforts in Cleveland have resulted in one of the most livable and public-transit friendly towns in the U.S. The city has three light rail lines and an efficient bus network, ranked best in the country in 2007 by the American Public Transportation Association. Cyclists are also common on Cleveland streets, with the city working to add many miles of new bike lanes. Fortunately for walkers, the largest colleges, Case Western Reserve University and Cleveland State, are both close to downtown. New Orleans’ public transit is part of its cultural heritage. Several classic streetcar lines serve the central parts of town, and buses travel out to the suburbs. The city’s flat geography and subtropical climate also make cycling a breeze. In 2010, New Orleans ranked eighth nationwide for percentage of pedestrians and bike commuters, according the League of American Cyclists. Thanks to these excellent alternatives, the large majority of students at Tulane, Loyola, and University of New Orleans don’t have cars. Nestled in the foothills of the Rocky Mountains, Boulder regularly earns national acclaim for its livability. The small city offers beautiful scenery year round, hundreds of miles of bike and pedestrian paths, and easy access to Denver by bus. As a result, only 11% of the 25,000 University of Colorado, Boulder students choose to own a car on campus. Located smack in the heartland of America, Lincoln is a small, albeit spread out, city with a bus system that connects the University of Nebraska’s campuses to most of the surrounding neighborhoods. The city is more than comfortable for cyclists and is ranked as a Bronze Level bicycle friendly community by the League of American Cyclists. At The University of Nebraska -- by far the largest college in town -- about half of the students have cars on campus. Bridgeport is served by a bus system that links various parts of the town and the suburbs. Thanks to efforts to redevelop the downtown area and waterfront, the city is also a great place to walk. Only about 25% of students at the University of Bridgeport have cars on campus. Highly educated and home to a large numbers of students, Albany is a progressive capital city. There are no trains around the city, but a bus system connects many parts of downtown. The city is compact, so historical downtown makes walking a pleasant option, especially in spring and fall. About 40% of students at the State University of New York (SUNY), Albany use cars to commute. The small city of Binghamton hosts a few college campuses, the largest being SUNY Binghamton. The 12,000 students of this well-known public university are helping revitalize the downtown, turning Binghamton into a walkable and fun city for students. The university offers free shuttles around town, and students can ride the public bus for free. Students are also encouraged to walk and bike. About 39% of SUNY Binghamton students have cars on campus. Downtown Trenton is a pleasant place for walkers, with an eclectic mix of architecture, bars, shops, and restaurants. The city hosts a few institutes of higher education, most notably Thomas Edison State College, with its almost 20,000 students, and Princeton University is only 45 minutes away on public transit. Beautiful Santa Barbara is nestled right on the Pacific coast, offering sunshine and moderate temperatures year round. The location makes for a perfect place to attend college, especially without a car. Of the 20,000 or so students at UC Santa Barbara, 94% don’t drive. The Santa Barbara bus system has many routes branching out from the central transit center, and biking is a citywide pastime. Thanks in part to numerous recreation trails, 18% of residents use alternative modes of transit, and the League of American Bicyclists ranked Santa Barbara as a silver-level bike-friendly city. Syracuse has a reputation for being a great place to live -- in college and beyond. In fact, it was recently ranked by Forbes Magazine as one of the top-ten places to raise a family. Most college students in Syracuse attend Syracuse University, SUNY College of Environmental Science and Forestry, or SUNY Upstate Medical Campus. For these students, going carless is a real option. There is a bus system that connects the town and college campuses with neighboring areas. Syracuse also boasts Amtrak and Greyhound services, making trips home easier for those who opt to attend school without a vehicle. Only about 20% of students have cars at Syracuse University. Cornell University and Ithaca College account for most of Ithaca’s urban population of about 30,000. The metro area as a whole is served by an extensive bus system, and Cornell actively promotes walking and biking. As a result, most of the city’s students live without a car. Known endearingly by its residents as "Happy Valley," State College is dominated by the almost 40,000 students of Penn State University. Of these students, only 17% have cars, thanks largely to the town’s walkability, public transit, and bike friendliness. The League of American Bicyclists ranks State College as a bronze-level bike-friendly community. Additionally, more than 10% of the local population walks to work or school, and a bus system shuttles students throughout the metro area. Home to the roughly 20,000 students at the University of Iowa, this college town has made a name for itself as an excellent place to pedal instead of drive, receiving the rank of a silver-level bike-friendly community by the League of American Bicyclists. The area is also served by a relatively extensive bus network, and students receive deep discounts on passes. Home to the prestigious University of Virginia and its roughly 20,000 students, Charlottesville is a great college town to study in without a car. Roughly 23% of the town’s residents and students commute on foot, by bike, or by bus, according to the League of American Bicyclists. The town has an Amtrak station and local buses offering free rides to students around the university. With only around 30,000 residents inside the city limits, a huge portion of Morgantown’s population is comprised of students from West Virginia University. For a small town, there are excellent public transit options. Students can buzz around campus in the town’s one-of-a-kind Personal Rapid Transit (PRT) system, which links the various parts of campus through small rail cars. The entire metro area is served by buses from the Mountain Line Transit Authority, and walking is also a pleasant option. Over 16% of Morgantown residents get around on foot, according the League of American Bicyclists. Home to the University of Vermont (UVM) and its roughly 12,000 students, Burlington is an iconic New England town, nestled on the coast of Lake Champlain with the Green Mountains to the east. For college students, a car is by no means a requirement. The downtown area is compact and walkable, with five blocks of pedestrian-only shopping and a picturesque waterfront. About a third of students do choose to own a car, mainly for access to the state’s famous hiking and skiing.